While many customers in the US are only just getting used to Apple Pay, mobile money services such as Vodafone’s M-Pesa have been flourishing in Africa for years. M-Pesa (‘M’ for mobile and ‘Pesa’ is Swahili for money) is a mobile phone based money transfer and micro-financing service which launched in African markets in 2007. By 2010, M-Pesa was the most successful mobile phone based financial service in the developing world and it is the African continent which has become the world leader in the adoption of this platform. In African markets less than 30% of the population have bank an account and even less have a credit card. Cash purchases are the norm, and the amount of cash in someone’s pocket at any one time can vary massively and this is what drives purchase decisions. With little data available to small businesses and no means to track sales and forecast production, many companies are pushing for a mobile driven, cashless future. And therefore, here lies an exciting moment of change for financial services. With little commercial banking infrastructure to overcome Africa is ready for mobile money. Driving this transformation is a desire for financial inclusion; many need access to affordable tools for saving, credit and loans. Second to this is the need to de-risk retail and trade which is currently based on cash transactions. M-Pesa was created to allow customers to conveniently receive and repay loans using the network of airtime resellers. The mobile money service offers customers a range of banking services which enable users to: withdraw and deposit money, transfer money to both M-Pesa and non M-Pesa users, pay bills, purchase airtime and in Kenya transfer money between a bank account. Only 4 million Kenyans have bank accounts. But 17 million people in the country now use the M-PESA money transfer service. This short film by CGAP shows how mobile money is changing the face of banking in Kenya. 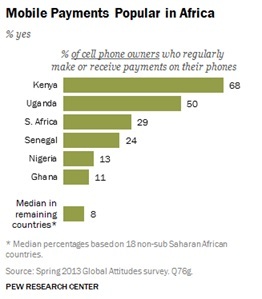 Mobile payments are hugely popular in Africa. By 2012 in Kenya, 17 million M-Pesa accounts had been registered and in 2014 over US$19 billion transactions were made through mobile phones. By 2014, nine African countries had more people have using mobile money accounts than actual bank accounts. The service has been praised for giving millions of people access to the formal financial system. M-Pesa has also spread outside of Africa, in 2011 it launched in India, in November 2014 the service expanded to Romania, and there are plans to expand over the rest of eastern Europe. The future for mobile money is bright, recently the launch of experimental startups like BitPesa to avoid steep transaction costs for receiving money from abroad is a great example of this. The service which is testing transferring money from the UK to Kenya by converting money into bitcoins purchased through the BitPesa website into Kenyan shillings and then to a mobile money account is a clear example of a changing banking landscape.